Season 2 is currently airing and takes a couple episodes to get going, but now is right back to serving up the pure joy the first season managed. Right you are. For some reason, I thought it was a Netflix Original (we were watching on Netflix), so assumed that we were done for now. Other than Seth Rogan this is an incredible cast. I'm very confused by the combination of "Lion King" and "live action". I assume there'll be costumes. Chiwetel as a villain again? Can we just cut to the chase and have Chiwetel Ejiofor star in literally every movie please? I can't imagine a world in which is doesn't happen so let's just fast forward a few years and get there please. I've been saying this since forever. Since I first saw him in something... I can't remember what, but it was before Serenity. Great. Now I nees to go back and watch for conflict between the Operative, a zombie killing sheriff, and a soccer playing pirate. With no hyperbole, I don't think I've laughed so hard at anything on the internet this decade. I don't think I've watched the entire thing, but dang, spot on. 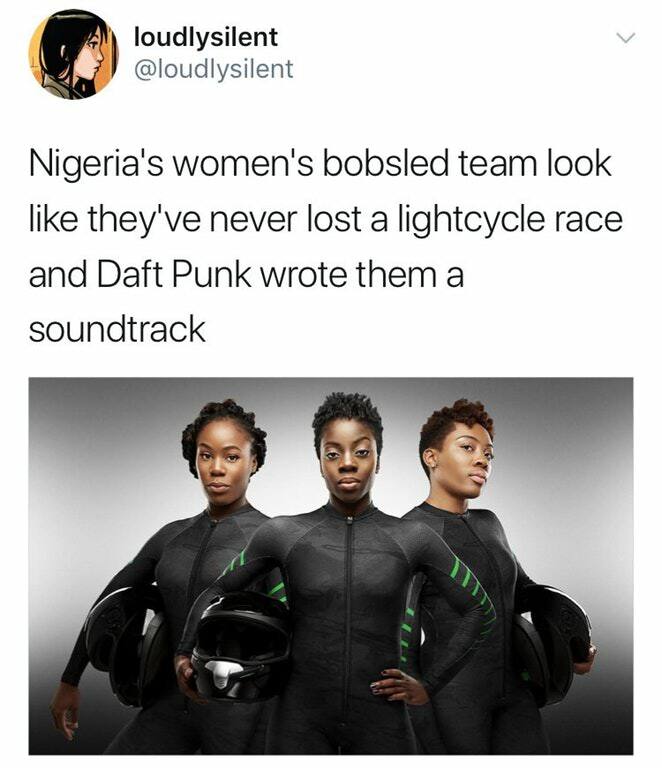 If you're unaware, they qualified for the Olympics, the first Nigerians to ever quality for any Winter Olympics event. As you might imagine, there's not exactly much funding for Winter Olympics competitors in that region, so the team ran a successful GoFundMe campaign to make it happen. Are you sure that's not the Wakandan bobsled team? No. They were disqualified for using vibranium runners. Please. If Wakanda lowered itself to competing with the idiot rest of the world, they certainly wouldn't get caught cheating. Just watched Mudbound on netflix. I didn't know anything about the movie before watching it. Took me a bit to really get into the movie. I wasn't surprised by anything in the movie but still enjoyed it. Great performances all around and they really hammer in why it is called Mudbound. This is going to sound weird. The show reminded me of the end to Vampire Hunter D Bloodlust. In both movies I was hoping some people would just get away and leave behind the world that can't except your love. I guess they kind of have a similar theme. Anyway the movie is well worth all the praise it is getting. Something I have been hearing a lot about lately is lighting. There are some shows and movies that do a really bad job of lighting black skin. I haven't really noticed this until it was pointed out to me. For example the show Dear White People has great lighting for all its multiple shades of black people. However, the movie Proud Mary has terrible lighting which is odd coming from someone that did The Shape of Water. I wonder if actors that are super pale have the same problem with bad lighting. Probably not to the same degree--it took decades for Kodak to even make test cards with people with dark skin. Then I eliminated Get Out. It’s a good B-movie and I enjoyed it, but what bothered me afterwards was that instead of focusing on the fact that this was an entertaining little horror movie that made quite a bit of money, they started trying to suggest it had deeper meaning than it does, and, as far as I’m concerned, they played the race card, and that really turned me off. In fact, at one of the luncheons, the lead actor [Daniel Kaluuya], who is not from the United States [he’s British], was giving us a lecture on racism in America and how black lives matter, and I thought, “What does this have to do with Get Out? They’re trying to make me think that if I don’t vote for this movie, I’m a racist.” I was really offended. That sealed it for me. You might be racist, but it's not because you didn't vote for Get Out. I have a feeling a lot of the Academy voters are still patting themselves on the back and thinking "Well, we gave the award to Moonlight last year, what more do they want?" I'm the tenth editor of National Geographic since its founding in 1888. I’m the first woman and the first Jewish person—a member of two groups that also once faced discrimination here. It hurts to share the appalling stories from the magazine’s past. But when we decided to devote our April magazine to the topic of race, we thought we should examine our own history before turning our reportorial gaze to others. Questions arise not just from what’s in the magazine, but what isn’t. Mason compared two stories we did about South Africa, one in 1962, the other in 1977. The 1962 story was printed two and a half years after the massacre of 69 black South Africans by police in Sharpeville, many shot in the back as they fled. The brutality of the killings shocked the world. Fast-forward to a 2015 story about Haiti, when we gave cameras to young Haitians and asked them to document the reality of their world. “The images by Haitians are really, really important,” Mason said, and would have been “unthinkable” in our past. So would our coverage now of ethnic and religious conflicts, evolving gender norms, the realities of today’s Africa, and much more. Mason also uncovered a string of oddities—photos of “the native person fascinated by Western technology. It really creates this us-and-them dichotomy between the civilized and the uncivilized.” And then there’s the excess of pictures of beautiful Pacific-island women. April 4 marks the 50th anniversary of the assassination of Martin Luther King, Jr. It’s a worthy moment to step back, to take stock of where we are on race. It’s also a conversation that is changing in real time: In two years, for the first time in U.S. history, less than half the children in the nation will be white. So let’s talk about what’s working when it comes to race, and what isn’t. Let’s examine why we continue to segregate along racial lines and how we can build inclusive communities. Let’s confront today’s shameful use of racism as a political strategy and prove we are better than this. For us this issue also provided an important opportunity to look at our own efforts to illuminate the human journey, a core part of our mission for 130 years. I want a future editor of National Geographic to look back at our coverage with pride—not only about the stories we decided to tell and how we told them but about the diverse group of writers, editors, and photographers behind the work. On The Magicians the actress playing the fairy queen is trans. I didn't know she was trans gender woman and I think this is first time I have seen a trans woman play a cis woman. Now that I think about it I have no idea if the fairy queen is cis. I guess I should say this is first time I have seen a trans woman play someone that wasn't obviously a trans character. Is there a problem with Apu from The Simpsons? The Simpsons creators came under fire over the character and a documentary about the negatives of the character was made. I think the problem with Apu is that all the jokes around him are Indian jokes. The character never goes beyond the stereotype. It doesn't help that Apu is voiced by a white dude. And as the AV Club pointed out, the Simpsons has done better in the recent past. That said, there’s a difference between thinking that and actually doing it, especially with a moment that could only be read as a glib “f*ck off,” delivered square into the camera. As much as it’s similarly reductive to go back to that well of “The Simpsons hasn’t being good since...,” it’s a problem that the show has demonstrably been able to write to and around in years past, even as recently as two seasons ago. Had it simply let “Much Apu About Something” stand as its final comment on the matter, that would have been fine. Not wholly satisfying to everyone, probably, but better than revisiting and reigniting the controversy, just to openly bait those who actually care about it by laughing it off. It’s a “Poochie died on the way back to his home planet” solution to the problem. When The A.V. Club interviewed Kondabolu in 2017, even he acknowledged that it was probably too late to really “do something” about Apu. The show’s been on forever, the character lives on in hundreds of reruns, and simply killing him off at this point would just be a lazy cop-out. But Kondabolu’s suggestion was surprisingly simple: Let him evolve. “The idea that Apu is still working at the Kwik-E-Mart versus owning these places seems weird,” Kondabolu said. “Make him a mogul. Make him wealthy. Make him somebody who’s actually had things work out for them—an immigrant who’s successful. If you’re not going to have an accurate representation, at least give him some upward mobility.” He also suggested bringing in those octuplets, maybe fudging the show’s already-obliterated perceptions of passing time to turn them into characters who can give voice to the kinds of Indian-Americans that represent him. Either scenario would have been easy enough, especially for a show that’s been on so long that its shredded continuity is just another in-joke. It’s hardly disruptive to the show’s spirit or character, and much better than just doing nothing—definitely better than literally rolling their eyes at the very idea of doing something. Most importantly, it would be very much in keeping with the way The Simpsons has always treated the character, until it suddenly decided it didn’t need to, because f*ck ’em. That’s a much bigger problem than just Apu.